Juggling between spreadsheets, emails and many apps costs money in wasted time and missed opportunities. Our online catering software gives you a centralized place where you can manage every detail and process, from bookings and orders to CRM and billing. Enhance the quality of your service to customers by using our collaborative tools to provide them with a seamless experience. Plus make a big impression with prospects using branded documents and fluid review-and-signoff processes. 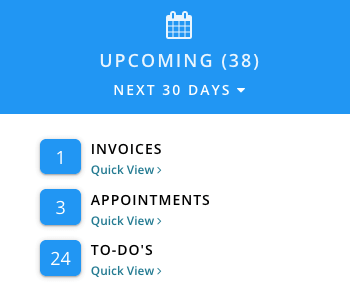 Our back-end business tools give you and your team a leg up on closing more sales and driving repeat clients with embeddable lead forms, at-a-glance dashboards, timely reminders, color-coded bookings calendars and detailed proposals and invoices. 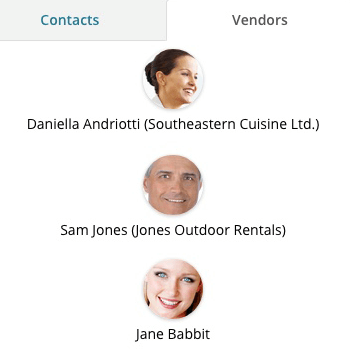 From marketing and sales to customer service and business development, our catering CRM tools let you track thousands of details regarding your clients, prospects, vendors and venue partners. Manage leads as they move through your sales pipeline. Track customer history and communications. Manage vendor assignments and venue bookings. View it all via at-a-glance dashboards and detailed event reports. And integrate with other applications like Quickbooks, Xero, Salesforce and MailChimp. 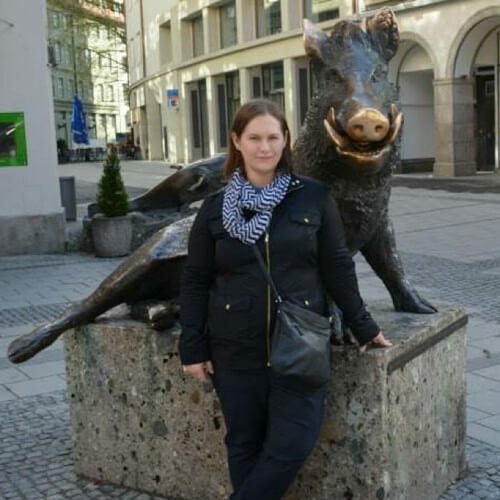 "It's so easy to use for creating all my proposals and billing my clients. Keep up the great work!" The last thing you want to get wrong is a booking date or an order detail. 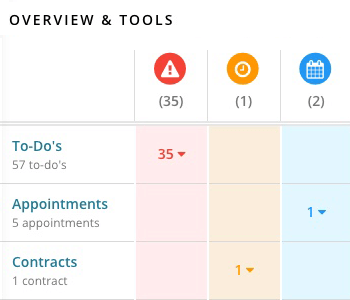 Our color-coded event bookings tools and calendar ensures you never double-book a client, shows your availability and lets you schedule appointments and calls (and sync with other e-calendars). Plus track order details for each event for the lifetime of each order, including delivery schedules and packing instructions. "We're able to keep the information and details for each event organized in the same place - contracts, invoices, messages, notes ... it does it all." Impress new clients and prospects by emailing them branded proposals and invoices with detailed line items and colorful images of your offerings. 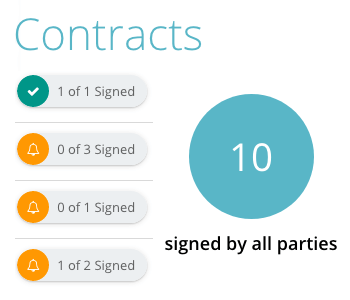 Collect electronic signatures on proposals and online contracts. 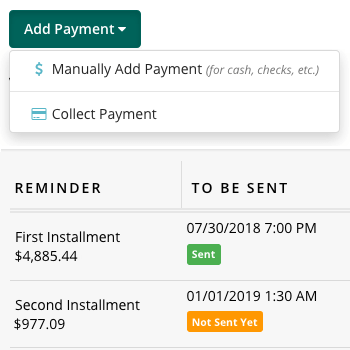 Set up scheduled payments for billing clients in installments. And collect online credit card payments via our payment processors. Our productivity tools make sure everyone in your business is on the same page and has the tools they need to deliver exceptional customer service. Schedule and assign tasks with email and text reminders. Build detailed event timelines and itineraries with staff and vendor assignments. 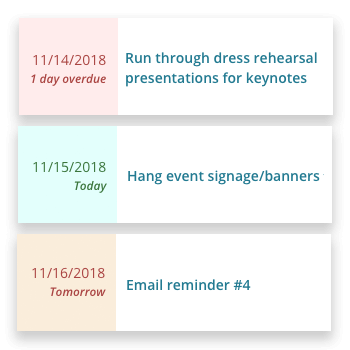 Share event calendars with assigned staff as well as messages and notes. 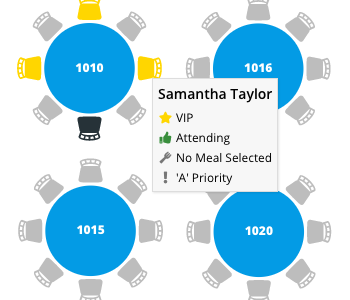 Our catering management software simplifies how meals are served with to-scale event floor plans and seating charts featuring guest names and meal choices. Create designs in minutes with drag-and-drop elements for tables, chairs, floors, stages, walls and more. 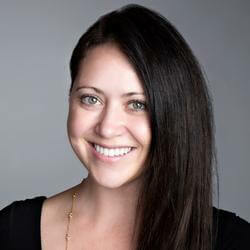 Upload guest lists provided by your clients and easily add guests to chairs. Our banquet management software tools enable your kitchen and front-of-house staff to know exactly what needs to happen on every order. Build detailed banquet event orders to circulate among employees. Create menus and menu items with associated prices and costs, and add recipes and ingredient lists for kitchen staff. It takes a multi-talented team to run a food preparation or catering business, mainly because everyone has to wear so many hats. Salesperson. Guerilla marketer. Customer service rep. Bookkeeper. Executive chef. Sous chef. Line cook. Delivery driver. Meal server. Dish washer. And clean-up crew. And, if you run your own shop, you usually have to wear all these hats at once. Because it requires such versatility to run a catering company, the banquet department of a hotel or group sales for a restaurant, you should expect the same level of versatility in the catering management software that you choose. Back in the day when software only ran locally on PCs, there were very few options to choose from, but now that online catering programs are available, you have many different types of platforms and feature sets to choose from, and the options span from all-in-one catering apps to more specialized banquet software programs. All of which can make your decision even more difficult because you are often not comparing apples to apples (that is, feature sets between different catering systems often differ from moderately to greatly). So how do you sort through all the chaff to make sure the catering software you pick is the right fit for your company? For starters, before you start your search, you should identify the core jobs that you want catering event management software accomplish for you. These jobs could span from CRM and lead management to billing and menu building and order management. But whatever your primary needs, make sure to write them all down in a spreadsheet ahead of time so you can cut to the chase when researching catering software on the web, reading product reviews and speaking with sales representatives. Building this list starts with brainstorming on all the processes and tasks that you complete in your catering business on a daily, weekly or monthly basis. Although this could be a daunting task, we wanted to give you a head start by identifying the 13 most popular catering software tools and features available across most of the top platforms - including Planning Pod, Caterease, spoonfed, ReServe Interactive, CaterZen, EventPro and Better Cater - so you get an overall sense of what catering apps can do for you when you are assessing your needs. It goes without saying, but any catering management software you are considering must make sense to you and feel like it is logically laid out (that it, the user interface should feel intuitive and natural). Cloud-based applications add the convenience of auto-updates and cloud storage of your data, and most Web-based solutions are also mobile friendly and can be used on iPads, iPhones and Android devices as well as on PCs and Macs. You should also inquire what kind of customer support benefits are offered, including help portals, free trials, online demos, training videos and live or virtual custom training. All event businesses are driven by our calendars, and this goes for catering, too. Our calendar tells us when we will be working, when we will be preparing to work and when we need to be looking for more work. So we need a tool that gives us a clear picture of all our bookings, our availability and makes for darn sure we never, ever double book a date, time or space. Look for bookings calendars that also sync with other electronic calendars that you use in your workplace (like Google, Apple, Outlook, etc.). Getting paid is a priority in any business, but the catering and banquet business has specific needs when it comes to the tools you need to bill your clients. Our customers expect clear definition of prices and deliverables while also wanting to see what they will be getting, so invoicing tools with lots of line item customization, imagery and even add-ons for service charges, delivery charges, tear-down and set-up fees are necessary. Charging customers in installments is also very common, so tools for creating payment installments and reminders can be very useful. Getting paid fast is also a priority, and so you should look for payment processing integrations for collecting credit card payments. Integrations with accounting programs like Quickbooks, Xero and Freshbooks also make life easier for your bookkeeper or accountant. If a detail doesn't make it into a catering order, it doesn't get prepared or delivered, so your catering software should not skimp on the amount of information you can store and access regarding your orders, starting with proposals. Either an intake form or proposal form needs to allow for templated information to be imported (like standard menu items or inventory items) as well as to add details on the fly. Creating change orders lets you track any modifications made by you or the client, and there should also be areas where you can manage delivery details (like packing slips and lists, delivery schedules, route planning, driver assignments, drop-off and setup instructions, and the like). Some programs even offer online ordering so customers can quickly place orders over the Web. For any business, your contact database is your most valuable sales and marketing asset as well as your go-to source for industry contacts, vendors and the like. As such, the catering CRM tool you use should store a wealth of information on customers - including order history, billing history and communications history - as well as for your staff members, contractors and any vendors who you partner with to provide services to your clients. Often catering businesses are run by professional chefs and food mavens, so sales and marketing might not be your primary area of expertise. No worries, because many catering event management software platforms offer up a rich variety of business development tools to automate these processes for you. These tools can include lead tracking for managing your sales pipeline and followups; lead webforms for capturing leads via your catering website; proposal builders; and tools for creating contracts and collecting electronic signatures. Email marketing and social media marketing and promotion are two additional areas where you can use speciality tools like Mailchimp and Hootsuite to manage your marketing campaigns, and some catering software programs integrate with these tools. If you cater events - like meetings, galas, luncheons, parties and weddings - you probably already realize that your clients hire you for services that extend beyond food preparation and hospitality and into event management. Luckily, many solutions also offer project management style tools for scheduling and assigning to-do's to team members; building event timelines so everyone knows what they should be doing and when; and creating to-scale seating charts with meal selections so servers know where to deliver meals. Also, look for platforms that offer reusable templates for task lists, checklists and worksheets as well as vendor management and event venue software tools. And speaking of food preparation ... any catering management software should offer some combination of food preparation and planning tools, like menu builders and menu/item costing; recipe management and building (including recipe scaling and nutrition information); food prep sheets; and beverage management. A big plus is a banquet event order builder that lets you create BEOs on the fly that contain key pieces of information for your front-of-house and kitchen staff regarding the menu, food prep, schedule and deliverables for each event. There's something to be said for having a bird's eye view of your business to see where you're succeeding and where you need to improve, so having comprehensive reports and at-a-glance, data-rich dashboards can serve you very well. Common reports offered by catering management systems include downloadable data files for sales/revenues, orders/events, accounts aging, invoices, contacts, reservation counts and food-and-beverage details. Online platforms offer the ability for multiple users - including staff, clients and contractors - to easily share information and ideas and communicate by posting messages and notes. 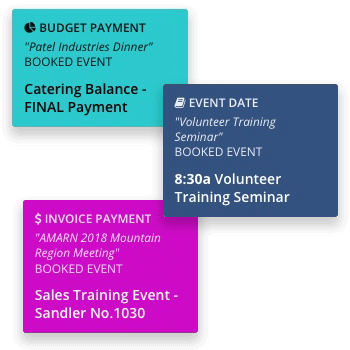 Most notably, these cloud-based catering programs allow users to share resources like calendars, task lists, timelines and even design tools for fleshing out your plans for every event. Every time you reach out your target audience is a marketing opportunity and can include interactions as basic as following up on a phone call or sending an invoice. So why not take advantage of these touchpoints by featuring your catering company's branding (including logo and company colors) in all your emailed and downloadable materials from inside your catering management software, which can include email headers/footers, proposals, contracts, invoices, timelines, budgets and reports. In this day and age, it's foolish to expect any company to use a single piece of software (and in fact, most companies use between 8 and 15 different software applications). So if you are being realistic, you should consider catering apps that integrate with other applications and platforms that you currently use, like Google Drive, Salesforce, Constant Contact, Quickbooks and more. Such integrations can be accomplished via platforms like Zapier or via stand-alone API integrations. Mainly offered by restaurant catering systems and point-of-sale software, employee management functions consist of staff scheduling, timesheet and clock-in tools. Inventory management systems are similarly included in more enterprise level solutions and include the ability to allocate inventory items and equipment (think tables, furniture and decor as well as linens, plateware, flatware, etc.) to events and track breakage and cleaning of items.